What do you get when you combine artichokes with spinach and eggs? A nutritious meal you can easily prepare on vacation. This recipe is a versatile breakfast, lunch or dinner meal. And, you can reheat the leftovers! Artichokes are high in antioxidants and fiber, and are good for the liver and digestion. Some people believe that they are great for hangovers, too! Spinach, of course, is considered one of the world’s healthiest foods, with many vitamins, minerals and antioxidant properties important for overall health. Place artichoke hearts in a mini-chopper or food processor and pulse for 5-8 seconds. Remove to a plate. Continue the same process for the onions, spinach, and tomatoes separately. Saute chopped artichoke, onion, spinach and tomatoes with 1/8 tsp of salt and pepper until veggie mixture is soft (approx. 5 minutes). Whisk together the eggs with water, hot sauce, and remaining salt and pepper. Add 1/4 cup of shredded cheese to egg mixture and whisk. Spoon 1/2 to 3/4 tablespoon of veggie mixture into 12 prepared muffin tins. Pour egg mixture evenly into each muffin tin until 3/4 full. Gently stir veggies in egg mixture. 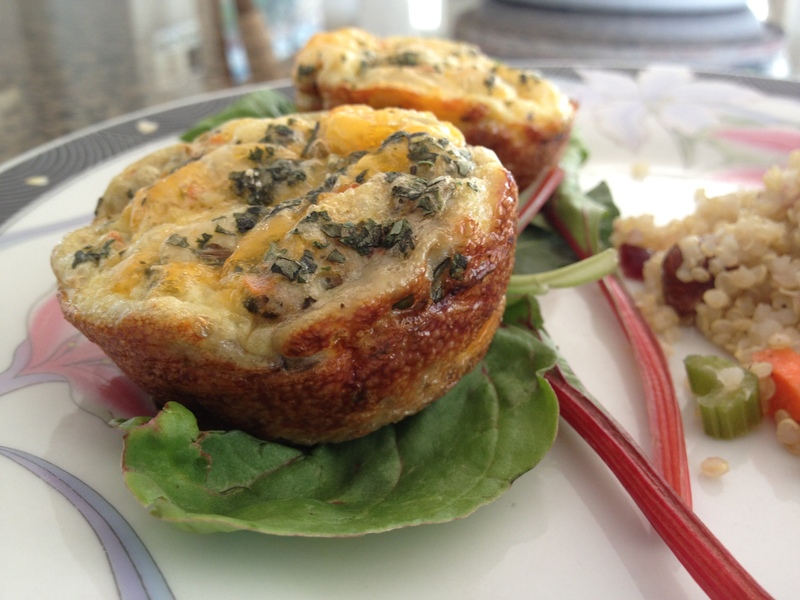 Sprinkle remaining cheese and basil on top of each muffin tin. Bake at 350 degrees F for 20 to 22 minutes.